Whether you're in need of a general check-up or comprehensive urgent care, house call medicine might not be the first option you consider. After all, many doctors stopped making house calls years ago. However, Dr. Michael Farzam at House Call Doctor Los Angeles can always be counted on to providing truly first rate medical treatment to patients, right in the comfort of their own homes. For many in need of urgent care, House Call Doctor Los Angeles is the ideal option. We specialize in treating various ailments, including puncture wounds, back and neck pain, alcohol and drug withdrawal symptoms, and much more. We're essentially a 24 hour health clinic for those in need of urgent care house call medicine. Of course, not all of our patients are in need of urgent care – House Call Doctor Los Angeles also offers laboratory services like blood-work and IV fluids, as well as X-rays, ultrasound, immunizations and sports physicals. Our in-home health clinic Los Angeles even offers consultation and referrals for respiratory therapy, spirometry, CAT scans, specialists, opthamology, psychiatry, and much more. 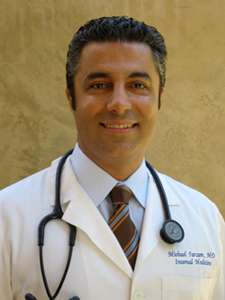 For over 10 years, board certified internist Dr. Farzam has been recognized for providing cost-effective and expert urgent care from Pasadena to Thousand Oaks, Culver City to Downtown Los Angeles and surrounding areas. Dr. Farzam has even been voted as 'Best Doctor' and received the 'Patient's Choice Award' and 'Patient's Recognition Award' for his medical service. If you're tired of waiting in long lines at clinics for urgent care in Burbank or other areas around Los Angeles, know that you have a better option. Even if you do not currently have a medical health insurance plan, you can take advantage of cost-effective and individualized medical care from Dr. Michael Farzam – the House Call Doctor Los Angeles – in the comfort of your own home.